Klaus Steffanowski was born on 28 January 1956. He married Désirée Gräfin zu Castell-Castell, daughter of Friedrich Ludwig Graf zu Castell-Castell and Amelie Gräfin von Pfeil und Klein-Ellguth, on 9 October 1982.1 He and Désirée Gräfin zu Castell-Castell were divorced in 1987. [S3238] Andreas Castell, "re: Castell Family," e-mail message to Darryl Roger Lundy, 13 August 2008. Hereinafter cited as "re: Castell Family." Friederike-Christiane Gräfin zu Castell-Castell was born on 18 April 1964 at Wertheim, GermanyG. She is the daughter of Friedrich Ludwig Graf zu Castell-Castell and Amelie Gräfin von Pfeil und Klein-Ellguth. She married Andreas Wassmann on 18 September 1987. Her married name became Wassmann. Andreas Wassmann was born on 11 April 1963. He married Friederike-Christiane Gräfin zu Castell-Castell, daughter of Friedrich Ludwig Graf zu Castell-Castell and Amelie Gräfin von Pfeil und Klein-Ellguth, on 18 September 1987. 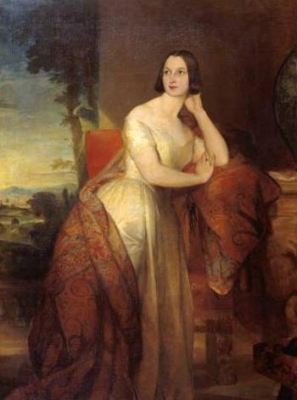 From 5 May 1830, her married name became Wilson. From 12 February 1842, her married name became Fitzpatrick.1 After her marriage, Augusta Mary Douglas was styled as Baroness Castletown of Upper Ossory on 10 December 1869. [S2] Peter W. Hammond, editor, The Complete Peerage or a History of the House of Lords and All its Members From the Earliest Times, Volume XIV: Addenda & Corrigenda (Stroud, Gloucestershire, U.K.: Sutton Publishing, 1998), page 158. Hereinafter cited as The Complete Peerage, Volume XIV. [S6] Cokayne, and others, The Complete Peerage, volume III, page 102. Franz Josef Prinz zu Schaumburg-Lippe was born on 1 September 1899 at Wels, Ober-Osterreich, AustriaG. He was the son of Albrecht Prinz zu Schaumburg-Lippe and Elsa Herzogin von Württemberg. He married Maria Theresia Peschel on 29 January 1959. He died on 6 July 1963 at age 63. Karl Künigl Graf zu Ehrenburg was born on 17 April 1905 at Ehrenburg, GermanyG. He is the son of Erich Künigl Graf zu Ehrenburg and Emma Prinzessin Reuss zu Greiz. He married Ilsa Liane Gräfin von Platen-Hallermund on 10 December 1931. He gained the title of Graf zu Ehrenburg.